SSSHHH! Hellgirl! Don’t give Skyrie san away! He’s the invisible man right now! // Based on what I’ve heard, the site is being redesigned from the ground up, but all of the data (our posts, groups and stuff) is going to be preserved. Apple is correct. An entirely new site, but all existing data will be preserved. // For future reference good citizens of Skyrie can report escorts by emailing their username to support@skyrie.net and our captain will banish them. Right, captain? I’ll be on a lot more once this update is done! // Skyrie san, Noloty seems to be experiencing some strange glitches with her profile. She seems to disappear, have double posts and recently a post that was meant for a group ended up on her profile wall. Perhaps you can communicate with her and help her resolve this issue. Arigato! The best thing to do is to email support. While I work on the update I’m not very active at answering messages on the site! Warning to the ACTUAL RP community. Escorts have been bombarding this site for years with their exploitative garbage that’s nothing new. But we have to be aware that they are now joining our groups and trying to pass themselves as “roleplayers” They are not roleplayers they are escorts exploiting people for money! Such insolence!! That’s what I call an eye sore! Whenever you see them email their username to support@skyrie.net and they’ll be deleted. The new site is currently scheduled for release in January 2019. It’s taken a year in development but it’s only a few months away now. // Tama mentioned that she sent you more but they are still there. ATTENTION MINNA: Please see Skyrie’s latest post for the latest update XD Good things are coming our way! Thank you for all the hard work making this place so special for everyone. // Understood :) And thank you for everything! We look forward to your amazing work captain Skyrie! // Are some of our posts missing? Are you doing the Skyrie update now? // nevermind.Guess it was my browser. I’ve added a VK field to the profile. You should be able to use it. Touma san wants an area add his alt social media link. Question: Do we have to do anything? Will we lose our photos or rp stories or blog info? Will the new site be secure? Will we have to redo our security settings? Nothing will be lost. No security settings will need to be changed. Security is a high priority on the new site, and it will be much more secure than the site currently is. Do still have to check that our emails are working.? Can we get rid of autocorrect? It drives me nuts on the phone. I can’t make any feature announcements just yet, but it is looking great so far. Autocorrect isn’t something we have control over, I’m afraid. Have you checked your phone settings? :( Skyrie, if you were here you’d fix my phone right? What about my email should I still update it? I don’t remember if I did. I’m gonna have to check. Emailed you our biggest concerns. And hope all goes without any issues. Okay so if you’re getting a new site for skyrie what will happen to this one? will all our progress here just be lost or transferred to the new site? Will this one no longer be needed? Everything will be transferred over. You won’t lose anything, don’t worry. Thank you very skyrie! That makes me feel better knowing that. Oi Skyrie! Arigato for all your hard work and the details! We look forward to seeing the unveiling. I wanted to pass on another concern. Will Skyrie be compatible with different browsers ? will this update that will take place soon help with the current inbox issue? I am sorry but I do not wish to see anyone’s linked messages. so far its only happened once but I would not want it to happen again. // I believe he answered that already Megumi. All the inbox and security issues will be resolved with the update. 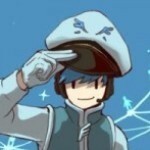 *salutes* Arigato for everything Skyrie san!